Flexi-Coil has announced the release of two additions to its 50 Series air cart line: the 2850 and the 3350. Well suited to farmers requiring high productivity and large capacity seeding, the 2850 and 3350 air carts have a capacity of 10,103 L (280 bu) on the 2850 and 11,528 L (330 bu) respectively. The new models are designed to simplify operations, expand capacity and increase productivity. The polyethylene molded tanks in the 2850 and 3350 air carts offer more capacity than the two-tank models in the Flexi-Coil 40 series line, increasing their efficiency. The two-tank design offers flexibility, allowing farmers to distribute two products at once, or simply use more capacity for one product. 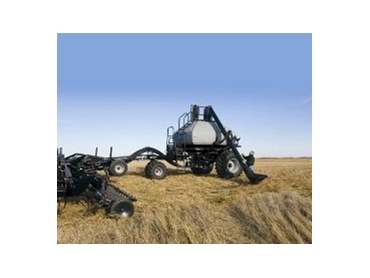 The air carts’ 254mm auger has additional top controls and is balanced for fast, one-person operation. Like the other air carts in the 50 Series range, the 2850 and 3350 models are designed to provide you with accurate metering and efficient operation. Down draft metering allows air and product to be mixed in a parallel flow for a smooth transition from the meter box to the distribution system. This enhanced blend of air and product results in gentle, precise metering. Both models are available with either variable rate metering or mechanical drive. Variable rate metering gives the farmer in-cab control of product rates, while mechanical drive allows a constant, accurate product delivery rate. Technology allows precision agriculture The Flexi-Coil 2850 and 3350 air carts come with the ISO 11783-compliant FlexControl III monitor as standard, taking technology to the next level for precision agriculture. Its colour, 25.4 cm (10-inch) touch screen is easy to view and lets farmers choose what information to display. FlexControl III is fully compatible with other ISO 11783-compliant machines, working with almost any GPS receiver or guidance system on the market. “The animated graphics make it easy to see what’s happening at a glance. Essential information such as on the go bin-level indicators; low bin level audible alarm; fan speed; ground speed; shaft rpm; application rate; air velocity; product/hectares remaining; and accrued area, which includes individual tank, field, season and lifetime calculations are clearly displayed. It lets you vary your rates on the go, build in operator instructions like calibrations and settings as well as receive pop-up warnings and information,” said Steve. FlexControl III can run prescription maps to automatically control seed and fertiliser applications. Ensuring seed and fertiliser are placed at the right rates and correct depths gives each crop the best chance of success right from the start – an essential component of precision agriculture.